The idea of combining work and travel is alluring. Travel when you want. Work when you want. The reality is somewhat different. A successful work and travel lifestyle takes planning and commitment. And a job that is conducive to remote work. If you already work remotely, then you are one step closer to a life of travel and work. Like many others, I wanted to see if I could combine work and travel. Fortunately for me, I work as a freelancer and already knew the joys of working remotely. I decided to give it a try during a one-month trip I had already planned. Having done it, I’m glad I started with a shorter trip. I learned lots about how to combine work and travel – and how to be better prepared the next time around. 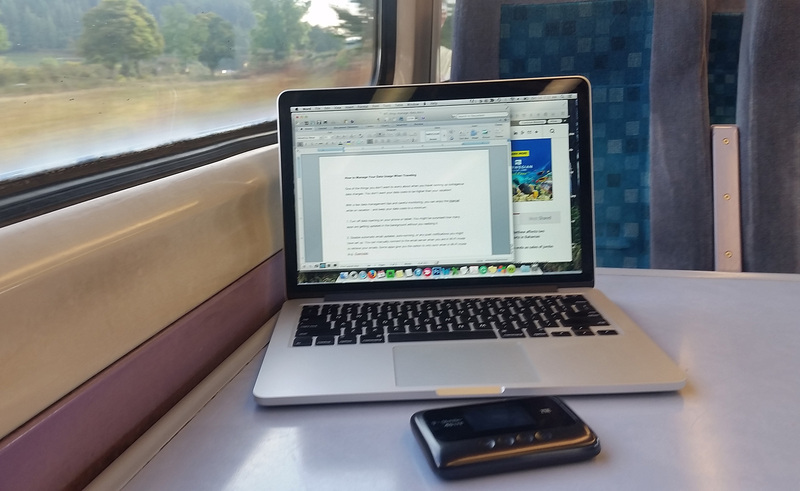 Getting work done while riding the rails. Schedule your work time. The work/play dynamic works best when you schedule your time. It takes discipline to block out a part of your day for work because it is very tempting put off your work and play tourist – especially if you have a sunny day.Before you go, you should already know how many hours per week you need to work. Find the times of day that work best for you and stick to your schedule. Whether you work a few hours each day or two or three full days each week, you’ll quickly find what works best for you. Factor in time differences. If you send an email requiring an immediate answer, you probably won’t get one if you send it while your client is sleeping. However, you might also find that working while your client is sleeping allows you to have uninterrupted work time – and you can have something waiting for them when they start their workday. Give yourself enough time in each location. It takes time and energy to move to a new place, and to get into your work rhythm. Short stays don’t allow for enough time to work and sightsee. You don’t want feel like you are missing out and resenting the time you have to devote to work. I know that my future trips will include longer stays in each location. Be flexible with your travel plans. If possible, allow some leeway in your schedule. That way, if an important job comes through that is critical or time sensitive, you can adjust your schedule and make time for it without losing out on any tourist time. When your workday is over, step away from your computer and close your “office”. Don’t try to be available all the time. Get out and see the sights – it’s the reason you are traveling! When you have scheduled time to work, stick to work. When you sit down at your computer, it is awfully tempting to first check your social media accounts, read non work-related emails, or check the scores of your favorite sports team. Before you know it, you’ve cut into your work time. When you have to extend your work time, you’ve cut into your free time. You’ll need a reliable – and secure – Internet connection. That’s a must. You’ll find Wi-Fi connections everywhere, but you won’t always find secure connections. I found that free Wi-Fi was available almost everywhere I was (hotels, coffee shops, train stations, etc.). However, almost none of them were secure. You can’t trust your work (and personal) data to an unprotected connection. 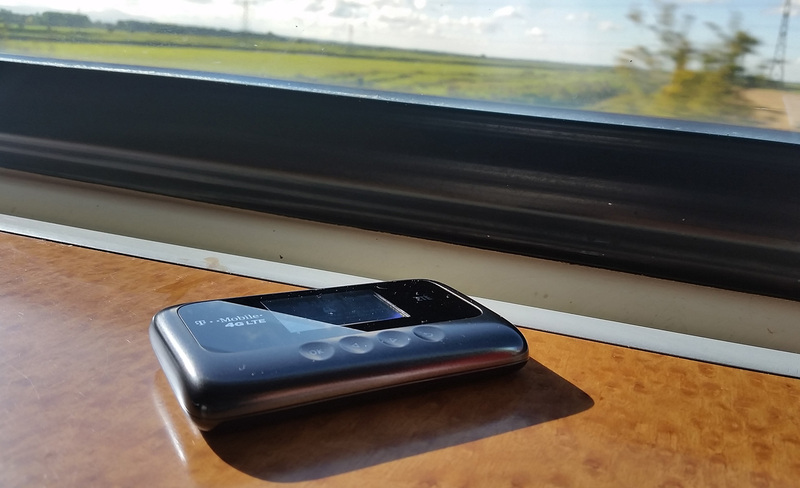 A Pocket Wi-Fi device came in handy while traveling. Don’t count on working while traveling between locations. Let your clients know you won’t be available. If you are able to work, and want to, it can be a great way to get in some work. There’s also a good chance you’ll want to relax and watch the scenery out your window. I was able to get work done on an extended train trip, and because I had a Pocket Wi-Fi, I had a secure Internet connection. It was the perfect time to get a little extra done. Make sure you can make and receive client calls, if necessary. While most communication can be done through emails and messaging, you might find a need to talk directly to your clients while you are traveling. I found that having a Wi-Fi calling app to be essential. Not only did I use it for client calls, but for calling my family back home, and to make reservations for tours and events. Would I try working and traveling again? Absolutely. In fact, I’m already planning my next trip! 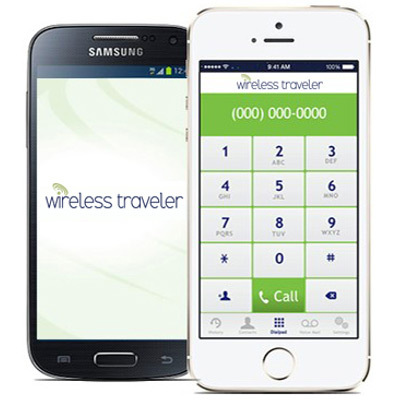 I’d like to give a big shout-out to Wireless Traveler for equipping me with a pre-paid Pocket Wi-Fi Hotspot and Wi-Fi Calling App. Having two reliable and secure ways to connect and communicate while overseas was invaluable.